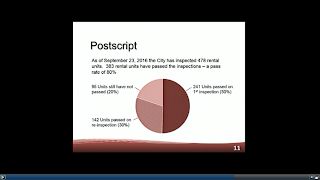 Council is the real villain in the monumental dishonesty of its favoritism towards towards landlords and rental agencies and real estate interests in bellingham. Now council actually show their anti city trends by allowing landlords to avoid facing 'Clean" property inspections by buying private inspections to exempt their liability to face city paid inspectors. Speaking as a landlord who takes immense pride in our relationship with the tenants in our one rental in the York Area, I want to note that some of us are just fine with protecting tenants, maintaining our rental, developing good relations with our neighborhood (I gave our phone number to our homeowner neighbor the day we bought the rental and asked that she call if our tenants every caused problems) and, gasp, being inspected. Ok, the $100 is a little painful and the shrill voices decrying the partying, parking and noise of unrelated tenants (as if a large family of, say 8 members, with a history of domestic violence isn't a more serious problem) gets a bit tiresome. But, overall, I love being a landlord, I enjoy the 60 or so students who have rented over the many, many years we've owned the house, and we take pains to keep rent below market averages, we maintain the property, we are forgiving if rent is late and we provide good, thoughtful references when they move. So please lighten up on occasion. My apologies to Ben Zero for approving this comment so late but I was travelling at the time and did not review comments until just this week. The big difference between a family household of 8 members and 8 unrelated is that the family household of that size is rare indeed while the unrelated group of 8 is prevalent in some neighborhoods resulting in a de facto upzone. At the right hand column of my blog I quoted from a court decision (Stegeman v. City of Ann Arbor) regarding family definitions. "To say that a family is so equivalent to a ragtag collection of college roommates as to require identical treatment in zoning decisions defies the reality of the place of the family in American society, despite any changes that institution has undergone in recent years. Only the most cynical among us would say that the American family has devolved to the point of no greater importance or consideration in governmental decision making than a group of college roommates."